Posted October 8, 2018 by Angie Ball & filed under Life and Health. Life insurance provides financially for loved ones after you pass away. Not everyone understands the value of life insurance, though, and you may have parents, siblings or kids who need to buy a policy. Several tips help you convince your loved one to purchase this valuable coverage. 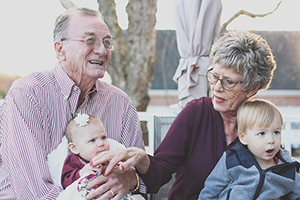 Your loved one may worry about how they’ll provide for the people who depend on them or cover medical expenses they incur as they age. Life insurance can replace their income, cover medical debts and take care of other concerns. Your loved one will gain peace of mind with this policy. Life insurance can provide financial resources for children, which is important if your loved one has kids. Their life insurance policy can pay for daily living, childcare and education expenses or leave a legacy for their surviving children. Many people take on a mortgage, student loan or credit card debt that may or may not be discharged upon death. Debt repayment can cripple the finances of survivors, but a life insurance benefit can repay debts and ease the financial burden survivors face. People generally do not like to talk about planning their funeral, but it’s an expense that could burden survivors. Talk with your loved one about the cost of a funeral and the advantages of covering this expense with a life insurance policy. Because life insurance premiums are typically tied to a person’s age and health, encourage your loved one to purchase a policy while they’re young. They will save money. As a bonus, their whole life insurance policy will have more time to grow in value the longer they own it. Your loved one may not want to buy insurance because of the cost. Offer to pay the premiums as a gift. The policy will remain in your loved one’s name and is for their benefit, but they won’t have to pay for it. Maybe your loved one has pre-paid their funeral, doesn’t have debt or children, and owns a group life insurance policy from work. Remind them that a private term or whole life insurance policy can provide additional resources for the people they love or causes that are important to them. They can also use their death benefit to support a favorite charity, university scholarship or social cause as they leave a legacy. Life insurance is a valuable asset. Use these tips to convince your loved one to purchase this valuable coverage for their peace of mind.